If your mornings are as hectic as mine are, you’re going to LOVE having a delicious, healthy breakfast option ready for you to grab-and-go. 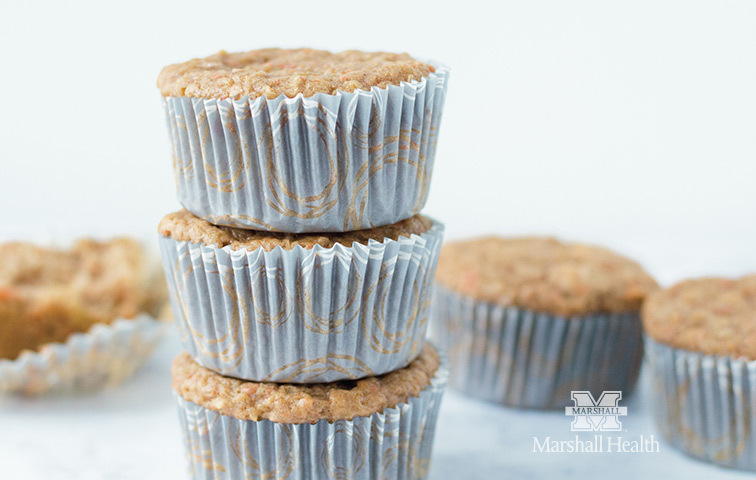 These morning glory muffins are packed with fruits, vegetables, and protein to keep you full and focused through your morning. This recipe is also easy to tweak to fit your preferences and to keep the flavors exciting week after week. 2. Smush the banana with a fork and add the rest of the wet ingredients (carrots, apple, eggs, syrup, ginger, vanilla). 3. Whisk together until well-blended. 4. Add the protein powder and whisk again. 5. In a separate bowl, add all the dry ingredients (almond flour, baking powder, baking soda, salt, cinnamon). Stir well. 6. Blend the dry ingredients into the wet ingredients. 7. Either line a muffin tin tray with cupcake liners or spray well with non-stick spray. 8. Fill cups 3/4 full. 9. Bake for 15-18 minutes. They’re done when an inserted toothpick comes out clean. Let them cool before you get after them or they’ll stick badly to the cupcake liners. You can add all.the.things to this base. My suggestions: raisins craisins unsweetened shredded coconut walnuts pecans crushed pineapple various flavors of protein powders You can also make substitutions with in the base. Swap out the banana for mashed sweet potatoes or canned pumpkin. Guest Blogger Ashley Stephens is a Huntington native, Marshall graduate, wife and mom of 2 who found a new love of flipping family-friendly recipes into healthier versions. In addition to running an online nutrition education program, Ashley regularly hosts live cooking classes at Huntington’s Kitchen.